Contains a number of antioxidant substances. Helps fight the oxidative stress responsible for ageing and the onset of numerous diseases. Luteolin (3’,4’,5,7-tetrahydroxyflavone) forms part of the large family of flavonoids which includes at least 4,000 different compounds. It is one of the sub-group of ivory-to-bright yellow pigments called flavones which are naturally present in artichokes, parsley, thyme, celery and propolis. It is now well-known that a reduction in efficiency of the mitochondria - the cells’ powerhouses - leads to increased generation of free radicals and is thus directly linked to the aging process as a whole. Some studies suggest that luteolin may combat mitochondrial aging by activating cellular antioxidant production, and may justifiably claim the title “anti-aging molecule”. Some studies have shown luteolin to be twice as effective at counteracting oxidative damage to DNA (using the Trolox test) as vitamins C and E and seven other flavonoids. In fact, this natural substance is able to prevent oxidative damage to cellular DNA from occurring, thus enabling DNA integrity to remain perfectly intact. In addition, enzymatic and genetic activity depends on constant re-methylation of DNA, which protects the body from a whole range of degenerative diseases. It seems luteolin helps maintain healthy methylation, preventing mutations to DNA that damage cells and are probably a cause of cancer. It is now well-established that certain neurological functions such as memory, cognition and motor function can be disrupted by interleukin 6 (IL-6) type cytokines, molecules that cause inflammation of healthy cells and prevent them from functioning optimally. Certain studies have shown that luteolin can eliminate excessive inflammatory cytokines in the brain, such as interleukin 6 and interleukin 1b, by acting on microglial cells, thus maintaining cognitive function, particularly memory and learning. In addition, luteolin helps reduce levels of amyloid protein by protecting mitochondria from free radical attack. When scientists supplemented the diet of mice with luteolin, they noted a 40% decrease in rates of fibrosarcoma. According to the researchers, the luteolin was acting on the initiation and promotion phases of the carcinogenic process, as well as improving detoxification. Luteolin was found to have the greatest anti-proliferative effect of all the substances tested. In another study, researchers found that pre-treatment with luteolin greatly sensitised TNF alpha-induced apoptosis in a number of human cell lines, including cancers of the colon and cervix. More recently, luteolin’s anti-cancer properties have been linked to stimulation of apoptosis and to inhibition of cell proliferation, angiogenesis and metastasis. Luteolin sensitises cancer cells to cytotoxicity induced by the suppression of cell survival pathways (P13K, NF-kB) and by the stimulation of apoptosis pathways, including those that induce tumour suppressor p53. These findings suggest luteolin may therefore be of benefit in fighting various forms of cancer. Recent epidemiological research has also identified that luteolin may have potential anti-cancer effects. Like quercetin or rutin, luteolin suppresses allergen-induced inflammatory response by inhibiting lipooxygenase. As a potent inhibitor of mastocyte production of histamine and other inflammatory substances, it could even lead to the creation of new types of anti-inflammatory and anti-allergy drugs. In vitro studies also show that certain flavonoids found in artichoke leaf, particularly luteolin, prevent oxidation of LDL-cholesterol and may therefore reduce the risk of atherosclerosis. This natural substance is completely non-toxic. The ideal active dose for optimal efficacy has been defined as 100mg a day. Since its effects are maximised by other flavonoids, it should be taken with the main meals of the day. Adults. Take one capsule morning and evening with meals. 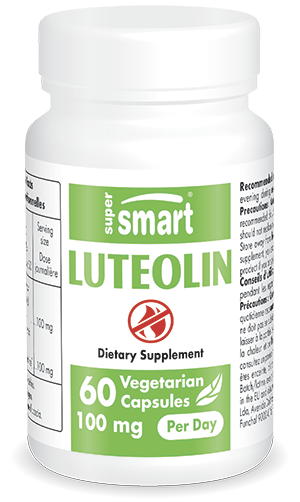 Each capsule contains 50mg of luteolin. Attention: contains arachide.